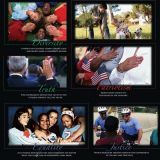 Features common good, diversity equality, individual rights, justice, patriotism, popular sovereignty, and truth. Eight colorful 11" x 17" posters plus a two-page teacher guide. 20 separate panels discuss electoral and popular votes, political parties, and more. 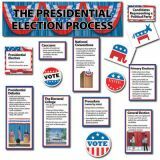 Use the detailed illustrations and labels in this mini bulletin board to teach a variety of social studies concepts. Set includes 28 interactive die-cut pieces, labels, a 21" x 6" title, and an insert guide with suggested activities. Use the detailed illustrations and labels in this mini bulletin board to teach a variety of social studies concepts. Set includes 22 interactive die-cut pieces, labels, a 21" x 6" title, and an insert guide with suggested activities.